I started this quilt in 2014. 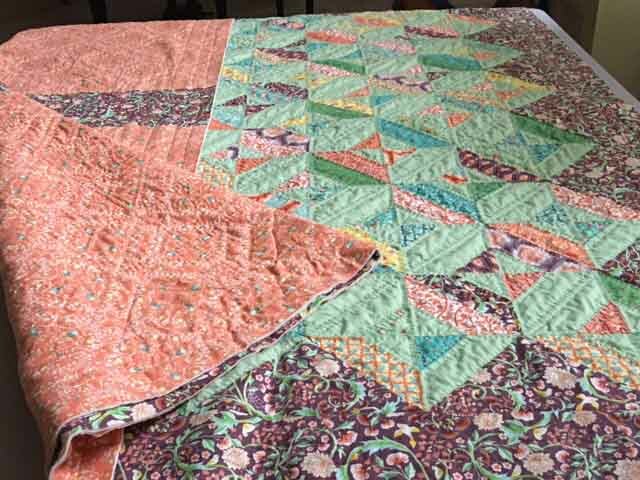 My original estimate for getting it hand quilted was 4 months. 4 years would have been much closer. It’s not that I didn’t know it would take work. Each block was about an hour…no matter how efficient I got at it, I had to re-thread a certain number of times, turn the whole quilt, shift positions, etc. It took an hour no matter how much I tried to reduce the time. Please. 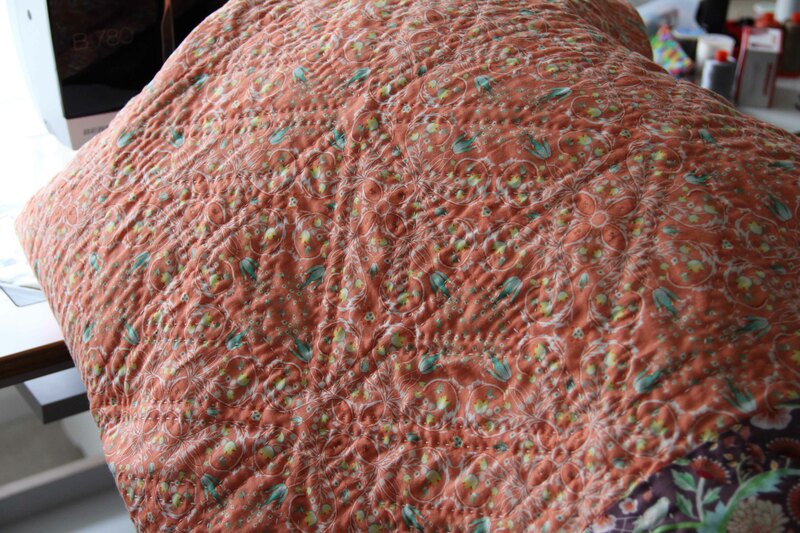 Between the time I started this quilt and the time I finished it (yikes, I still need a label!) I completed countless other projects using my “expensive” machine. Still, I don’t regret a single minute of the hand work. I listened to podcasts, I watched my DVD’s of Downton Abbey. And sometimes, I just sat quietly and used it as a meditative practice. Why do anything by hand? Why bake bread when you can pull it off a store shelf? Why paint a picture when you can capture it all on a cell phone? Why talk to anyone in person when you can text? Why walk down the street, for heaven’s sake, when you can get in your car and be there in no time? Why grow a tomato at home when you can get it at any store, or, more virtuously, at the farmer’s market? But doing things with our hands teaches us something. It teaches us patience. It teaches us that all the products around us take energy, resources and time to produce. It teaches us to respect process, and maybe, just maybe, to recognize our culture’s love of instant gratification. If someone had told me when I started this quilt that I wouldn’t finish it for three years, and along the way I would face life and death and sorrow and joy and pain and frustration, I would have told them no thanks. I want things to stay peaceful and uneventful. Instead, I put it into the stitches. That’s what we do, you know…those of us who try to do things by hand from time to time. We put the tears, the laughter, the anger, the frustration, the love, the humility and all the emotions right there into the work. But I don’t have to tell you that. If you’re a quilter, you already know it. 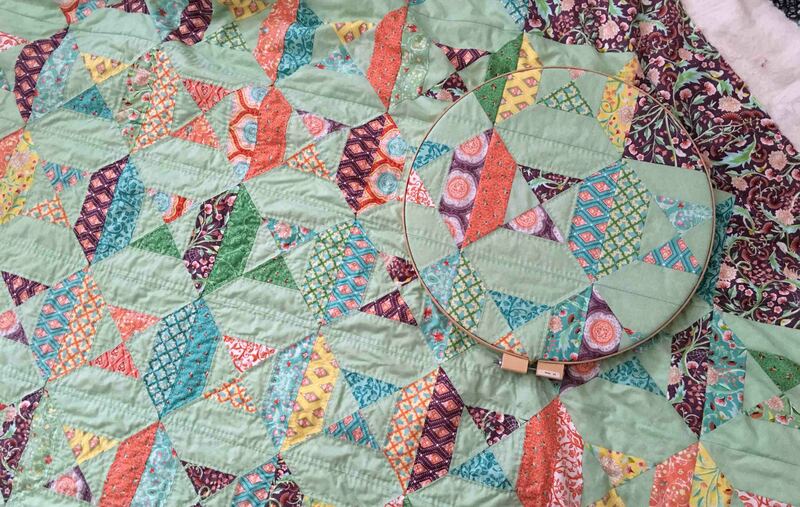 I have been working on hand quilting this queen sized quilt for, oh, two years now. My initial intention was to work on it a little every day and have it done in a year. Months go by between times when I sit down to work on it. Other days, I get a flurry of hand work done. But my prediction at this point is another two years. Seriously. I am easily distracted by other more urgent/exciting/interesting/challenging/fresh/you-name-it projects. Still, I come back to this one when I can. I would say at this point I am 60% complete. 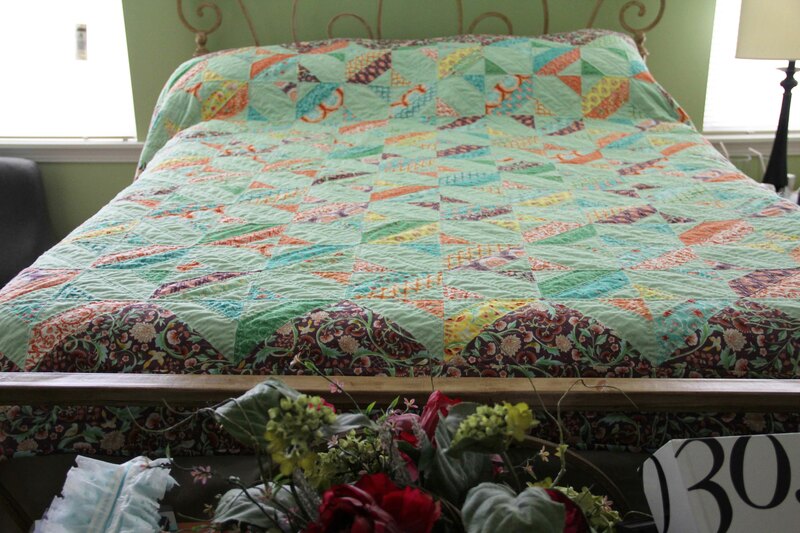 I have hauled this quilt into the bedroom, the family room, the sewing room and back again dozens of times. The center is basically quilted. The outside two rows of blocks are still undone all the way around. And then there’s the border. And then I’ll need to add the binding. Progress is slow, but I AM making progress. Those hand stitches are so cozy-looking up close. Everyone needs a long-term project. If nothing else, it teaches me patience and perseverance. It reminds me that work done by hand is still precious, still relevant and still worthwhile. It’s no longer just a quilt. It’s a commitment. Below is the type of project that distracts me..and yet still needs to get done! I really love the Kraft-Tex product, which is a fiber for crafters and sewists and artists, which does not tear. You cut it up like fabric, it sews and wears like leather. The more I play with it, the more I like it. I’ve been told that it’s the same fiber as the Levi jeans logo..you can wash it and dry it and it will just get softer! I selected a decorative stitch and added it to the edge, and finished everything off with a triple stitch. Because it doesn’t fray, you don’t have to finish the edges. The only caution I would offer is to be careful about the decorative stitching you choose. Because Kraft-Tex behaves like leather, the stitching causes perforations, and you don’t want to use a very heavy satin stitch as it will separate along the holes. You want the project to hold together well, so the lighter the stitching, the better. In this case, I used King Tut variegated thread which adds a little interest. King Tut, however, calls for a 90/14 topstitch needle. I used an 80/12 topstitch for fear of making the holes too large. Test all your stitches out on a scrap. Here’s a link to another project I did using Kraft-Tex. Something old..and ongoing. Something new..and done. Please don’t make me choose.